Unionville's Windoview had an impressive debut this past weekend. NEWTOWN SQUARE — Usually when you think of a musical group made up of high school students, you think of loud, unpolished rock and screaming voices, or perhaps hip-hop, with the occasional singer-songwriter. The imagery evoked would be that of a butterfly newly over its exhausting effort to free itself from its cocoon so it can slowly begin to fan and spread its wings. Not so last night at a cozy little venue, Burlap & Bean, as Windoview (http://www.windoview.com/ ), a band from our own Unionville High School, played the opening act. 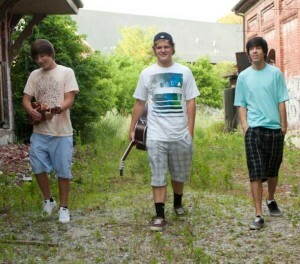 Original members Andy Joseph (lyrics, vocals, guitar and ukelele), Hunter Conover (lead guitar, backing vocals) and Jordan Mizrahi (guitar, melodica) opened this short window of time known as the second half of senior year and invited Jacob Block (drums, percussion) through the window to enjoy the view as the four of them make plans to head off to their respective colleges. Having played together for the first time briefly at the UHS coffee house on February 10, the foursome rehearsed just once the day before before heading out to Burlap and Bean on the invitation from Phys. Ed. Teacher/singer-songwriter-guitarist extraordinaire, Chris D’Esposito (http://www.myspace.com/chrisdespo ), who played the featured act along with longtime friend and collaborator Alfred James (electric cello, vocals, lyrics) ( http://www.alfredjamesband.com/ ). What was most striking about the opening act was the poise. They sounded tight, as if they had been doing this together forever instead of having just put it all together that day. Andy Joseph, whose heartfelt, intelligent lyrics show not only a mastery of poetry but a mature understanding of people and relationships, poured passion into his singing while holding it down nicely on the guitar and ukelele as well. At least half of Windoview’s set list last night were Joseph’s original songs, with the music component provided by Conover and Mizrahi. Hunter Conover effortlessly moved the songs along with his confident and poised command of his instrument while Jordan Mizrahi seamlessly flowed from lead guitar to sometimes Spanish tinged solos. On a few songs he switched over to play the melodica, which is also known as the “blow-organ” or “key-flute” and is a free-reed instrument similar to the melodeon and harmonica. Jacob Block brought a flow and rhythm with his highly developed sense of meter that, according to Mizrahi after the concert, “brought us to a different level.” The band looked incredibly comfortable together and it will be a pleasure to see them play together over the next 3 ½ months. The main act was Chris Despo with Alfred James. Everyone who has been in our district the past 5 or 6 years knows Mr. D’Esposito, but unless they were taking health at Unionville Elementary School when he taught it there (and played his guitar to the delight of the children), they may not have known how incredibly talented this young man is. He brings energy, passion and emotion to his performance while singing about love, family and relationships. He most recently released his first full length CD. He has performed at numerous venues, including Verizon Hall at the Kimmel Center, where he played with members of the Philadelphia Orchestra. He was joined onstage by Alfred James, his friend and musical collaborator who also plays on the album. He is to date the only known cellist (and self taught, at that, having taken no lessons till after college) in the world playing a black, 5 string carbon fiber cello while standing. For good measure, he also played the didgeridoo, a wind instrument developed by indigenous Australians of northern Australia around 1500 years ago. The instrument created a sense of urgent expectation while the drone evoked images of dark and foreboding places. The two played a long set list of original compositions written by by each of them, stopping only to inject the evening with humor and medically based trivia questions, with the correct answer earning a copy of Chris Despo’s new CD. Thankfully, I still remember anatomy & physiology from freshman year of medical school (thank you Professor Carson Schneck). The good old sartorius, the longest muscle in the body, who would have thought I would have needed that while sitting listening to an evening of excellent music while enjoying some of Burlap & Bean’s perfectly roasted coffee in the company of my wife, Julie, and some friends. Fantastic article! I am always amazed when ever I read Dan’s writings. I am so proud of him. (HE IS MY SON).